Earlier this morning a DNS hack took control of Twitter.com traffic and redirected to a website with a splash page proclaiming, "THIS SITE HAS BEEN HACKED BY IRANIAN CYBER ARMY." This hack has a lot in common with the Dr.Hiad website defacement I reported on two weeks ago. 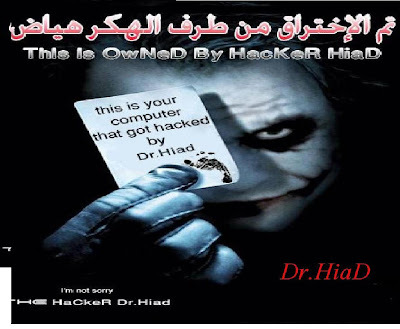 The so-called Iranian Cyber Army has defaced websites in the same manner as Dr.Hiad. At this moment (7:35AM Eastern Time) there is a website displaying the exact image that Twitter users saw earlier today during the Twitter hack event. A screenshot of that web page is shown below. The webpage contains an email link to the Iranian Cyber Army's Gmail account. It is likely that the Twitter DNS attackers simply pointed "twitter.com" to the IP address of a defaced website like the one below. It would not make sense for them to point Twitter traffic to their own web server: that would allow them to be traced and possibly caught. When the Twitter attackers realized they could take over Twitter's DNS, they had to decide where to point the traffic. Redirect it to comedycentral.com? Disney.com? Or how about a defaced webpage bearing the image of the Iranian Cyber Army? There is some chance the Twitter attackers executed both the website defacement and the DNS takeover. DNS is the Internet service that kicks in when we type a website name into our browser or click a link on a web page. Type "twitter.com" into your browser and DNS will lookup the IP address of the Twitter web server so your browser can connect and download all those tweets. As fundamental as DNS is to our Internet experience, it has virtually no security, particularly on our home computers and Internet connections. Also, the DNS servers "up in the cloud" are rife with vulnerabilities that enable attackers to gain control and carry out pranks like the Twitter redirection this morning. The defaced website that Twitter users were directed to, shown in the screenshot above, is an online forum for the Green Freedom Wave, an Iranian reform movement. The Green Freedom Wave website was hosted at Netfirms, a managed web server company that is well-known to website defacers who exploit weaknesses in web and database servers. These web hosting companies offer lots of functionality, including web sites, databases and online shops, at very reasonable prices. However, these features also can make them vulnerable to compromise. The website defacement is the minor part of this story. The DNS takeover is extremely serious, especially since it happened at Twitter.com, which receives over 20 million visitors per month. If the Twitter.com site had been redirected to a web page containing malware, a huge chunk of the Internet population would be infected. Perhaps I should say a "huger" chunk: 35 million computers infected per month with one type of malware. The Green Freedom Wave website was probably hacked using SQL Injection, Remote File Inclusion, or similar techniques that are well-documented on the web. Note the signature line of Dr.Hiad from my earlier post. Remote File Inclusion allows an attacker to exploit a script on the target website to replace the home page of the website. I will be a speaker at a free cloud security webinar sponsored by Enterprise Florida on Thursday, December 10 and 2PM Eastern Time. Cloud computing is a topic generating both hype and anti-hype right now. The anti-hype comes mostly from the security community warning that the benefits of fast, easy development and hosting are just what we do not need right now. Also presenting will be Chris Day, Chief Security Architect at Terremark, and Alex Eckelberry, CEO of Sunbelt Software. The event is moderated by Esther Schindler, author and industry expert.